Explain evaluation of information systems. How much an organization can rely on the information it gets from it's information system is a criteria while evaluating the information system as if the information system is not providing reliable information then there is not mean to have it in the organization. Information systems are meant to deliver information when asked for. So if an information system can't deliver information in time, that if information is unavailable at the moment when required, the whole system becomes useless. An organization implements single or multiple information systems to get support in every levels of the organization's operations. Thus an efficient information system is supposed to support business operations in each level. To survive and run successfully in the market an organization need to face and win various challenges from other organization in the market. 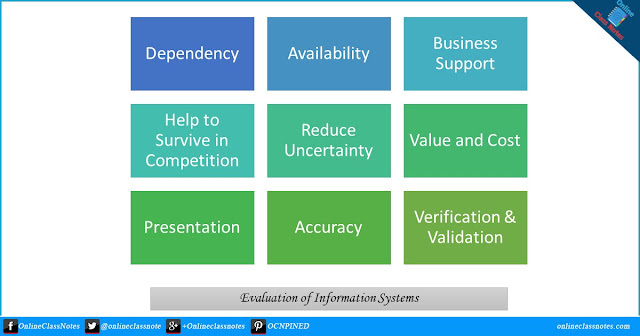 Information systems are supposed to help organization in this survival by delivering competitive reports. Information systems are supposed to deliver forecasts based data and current market data to take business decision in a way that reduces uncertainty of the business. The cost of developing, implementing and running an information system must be less than the value of the information it provides. If it is more costly to operate an information system than what the information system gives in return then there is no need to have such an information system. Efficiency of an information system depends on the presentation of information by the system. The information system that represents information in an attractive, easy and more understandable format is obviously more efficient than others. Like reliability of the information achieved from an information system, accuracy of the information is also important. If data were collected from multiple sources then information system must cross-check the data to verify and validate it before using it in processing to generate information.